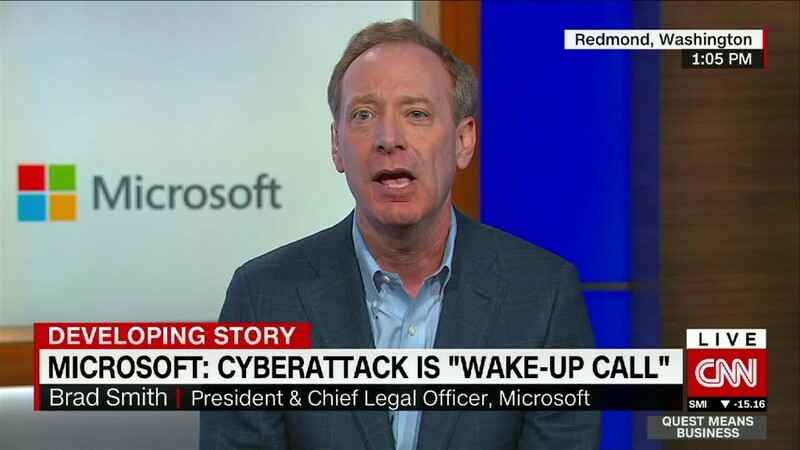 Microsoft's president and top lawyer said Sunday that the ongoing cyberattacks, which experts are calling the largest in history, should be a "wake-up call" for governments -- especially the U.S.
Smith said Microsoft has the "first responsibility" to address the problem. But he also placed fault in national governments. The security flaw that hackers used to launch the attacks Friday was made public after information was stolen from the U.S. National Security Agency, which routinely searches for flaws in software and builds tools to exploit them. The NSA alerted Microsoft (MSFT) about the issue three months ago and the company released an upgrade that patched the flaw. But some experts have argued this attack could have been vastly mitigated if the NSA told Microsoft sooner. "As cybercriminals become more sophisticated, there is simply no way for customers to protect themselves against threats unless they update their systems," Smith wrote. "Otherwise they're literally fighting the problems of the present with tools from the past."